College graduates learn very quickly that paying hundreds of dollars toward student loans each month makes it difficult to afford things like a nice apartment or a car. But they might not appreciate the long-term consequences of their record levels of borrowing: college debt is an added threat to their retirement security, according to a new study by the Center for Retirement Research. The researchers gauged the debt’s impact by looking down the road to retirement and projecting what would happen if working people of all ages had started out with the same profile as young adults: 55 percent of today’s 20-something households have student debt, and they owe $31,000, on average. 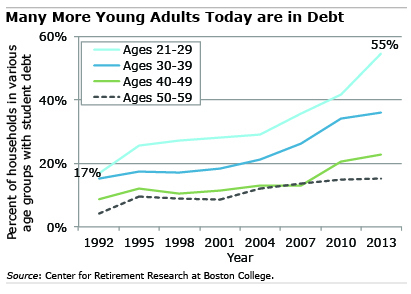 College debt has a bearing on retirement security through two avenues. First, money going into loan payments is not available for a retirement savings plan. Second, lenders place limits on how much total debt a homebuyer can have, forcing many borrowers to delay home purchases; and getting a home loan would be very hard for the 17 percent of student loan borrowers delinquent on their debt. Based on these assumptions and using 2013 data, the Center’s National Retirement Risk Index shows that those at risk of a lower standard of living when they retire would increase sharply to about 56 percent of working U.S. households – compared with 52 percent at risk when the student loan projection isn’t figured into the NRRI calculation. This “represents a substantial increase in the already alarming rate of households at risk,” said the Center, which supports this blog. With so much at stake for future generations, the Center suggests that college costs should be part of policy discussions about improving Americans’ financial security.